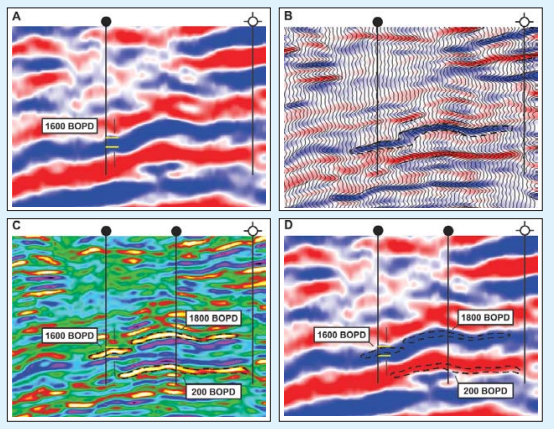 Braided fluvial reservoirs can host significant volumes of hydro-carbons, being high net/gross ratio, and are often considered to be relatively easy to characterize. But this is not always the case, as confirmed in a recent study conducted by Houston-based reservoir services company Geotrace Technologies Inc. The Misoa Sandstone reservoir in Venezuela’s Lake Maracaibo Basin shows consistent permeability distributions and can be easily correlated using logging interpretation. However, a dry hole drilled a little more than 300 ft (100 m) away from a known producer within the Misoa Formation could not be correlated with an adjacent well. A solution using seismic interpretation technology and an enhanced imaging process identified the source of the discontinuity and helped Geotrace optimize its client’s drilling program. Janice Liwanag, Geomodeling Technology Corp.